If you haven’t used a cloth like this before… you’ve been missing out. Now that summer is here, the skin-sludge begins. 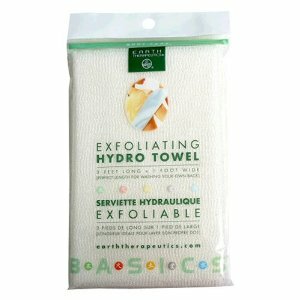 Instead of using bath products with exfoliators that might dry your skin, use an exfoliating bath cloth. This is a great one! Target also has one from The Bathery for $2.99/ea. that also work well. What I find most useful about this towel/washcloth is its cleanliness. Loofahs and scrub puffs hang there in the shower to dry and begin to fill with bacteria and all the soap that gets stuck in the center — GROSS! These exfoliating cloths rinse clean when you are through and you don’t need to use very much of your body wash to get a nice lather. You can also extend them and get your back scrubbed too! This is a MUST!! great review! Do you know where I could find one of these? Thanks! You can find them at Ulta or online at Amazon. Some Targets might have them, depends on how large of an Earth Therapeutics line they carry.